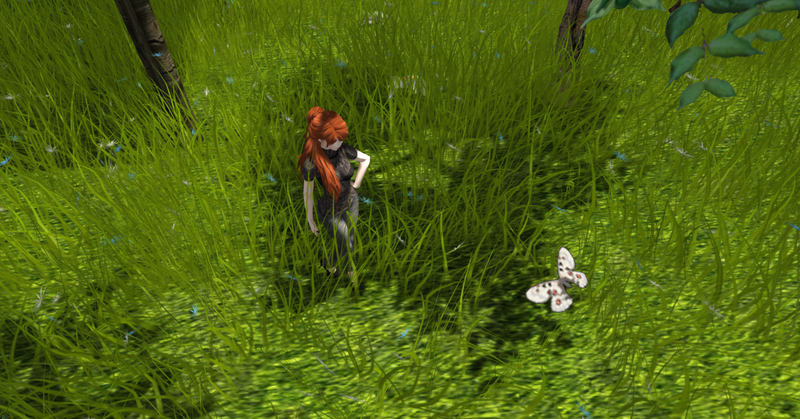 As Second Life advances, everything within it is taking on more of an air of realism. Okay, well, maybe not everything - but it is fair to say that everyone from skin creators to those who make grass and water are producing new levels of verisimilitude. Graphics are getting better. Cameras are getting better. Software for drawing is more sensitive. Part of that bid for realism, perhaps, Linden Labs introduced the concept of shadows. As I understand it, this was foreshadowed (I'm sorry, I had to - but even I am cringing) by content creators who had already begun giving their objects shadows by attaching a shadow texture to a very skinny prim they could slide beneath their object (non-SL users: imagine cutting out a circle of black paper and placing it beneath a tennis ball. Ta-dah, a D-I-Y shadow). This seems like a natural progression, but, when you break it down, it's a very bizarre thought, since we take shadows so much for granted in our everyday life. Why wouldn't we? They are part of the very fabric of our world and the way we understand it. That Linden Labs noticed this - did they have any help from SL users? I have no idea, and Google isn't telling me - and implemented them in a more dynamic method than the black-paper-beneath-a-ball effect is completely miraculous and cool. Shadows are dynamic. I can mess around with the Windlight settings and, depending on where I place the Sun in the sky, the shadows move. Let's have a teensy deus ex machina moment. Okay, I'm done with that. Here's the other side of the coin. What's strange (albeit, wonderful), about having shadows in SL is that they are adding a layer of reality to something that...well...is perhaps lacking in the realism department. Let me say upfront: I know nothing about software and game-building, and I'm not criticising those who are involved in this, at all. I have no idea how hard it must be, and I appreciate the effort that goes into creating things like SL - which, as I have already said, is awesome! Anyway. Check out Kitti's elbow in the above picture. The shadow on her forearm and her shoulder make me want to jump up and down and clap, but her elbow looks weird. The avatar mesh isn't good with bent elbows. It's also really, really rubbish in the foot department. Avatar system feet are weirdly shaped and all the toes are joined together. Now, this problem has been solved by the introduction of mesh feet, I know, but I just wanted to highlight (couldn't avoid that one, sorry) the juxtaposition present here. There's a kind of comment on reality here, too, though it's not one that Linden Labs went out to make, I don't think. They have made Second Life and the avatars within it more real by allowing them to cast shadows. Kitti, although it is lost in the first picture amongst the shadow of the tree, casts a shadow on the ground, and is therefore there, present, and (virtually) real. She is interacting with a (virtually) real environment, a (virtually) real Sun. She makes a mark on the world. Isn't there a quote somewhere by someone famous about the cruelty of humanity that leaves a mark on the world? Food for idle musings only.